Teaching requires human interaction. The relationship between teacher & student is one of the most important relationships outside the family unit. It requires trust and mutual respect. This is so evident in the early years when a child starts school. Every parent knows that their bond with their child changes as their child develops a new bond with their school teacher. For the first year their sentences often start with “my teacher says….” Successful teachers know their subjects, their students and pick up on their emotions and the atmosphere in the classroom. However increasing workload means teaching staff are often using online teaching resources to educate the children, allowing them time to catch up on their paperwork! Often as I enter a classroom for my teaching slot, the class teacher proudly announces that the class are ready for yoga as she has left them in front of the smartboard watching a yoga video. The children are often over stimulated by ‘performing’ their yoga while there is no interaction between classmates or any connection with the children and their bodies. Developing positive relationships and connecting with our students has a positive and significant impact on students’ lives both academically and socially. This is a missed opportunity for the teaching staff to build a deeper connection with their students – that shared smile as the child becomes unsteady in a balance pose; the shared feeling and look of relaxation on student and teacher as they come out of a relaxation; and the shared sense of achievement as that trickier pose is mastered. Training our school teachers how to use yoga successfully will not only help them build deeper connections with their students but can also help deal with their own stress levels. Many teachers relish the thought of learning yoga while others are put off by the thought that it’s another task to be completed in their already busy, school day – so now the 3R’s have been extended to Reading, Writing, Arithmetic and Yoga! However these can be combined and I don’t mean learning long division while standing on your head, although that would certainly make it more fun! 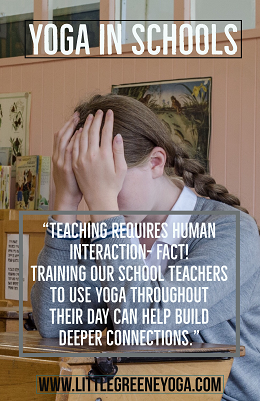 This doesn’t mean taking time out for a daily yoga class but integrating yoga throughout the school day, providing skills for life and perhaps making the job of a teacher just that little bit easier! 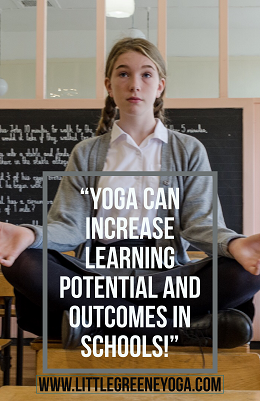 Yoga can increase learning potential and outcomes in schools. Imagine – It’s been a long day and the children are fading fast but teacher has a schedule and was really hoping they could get to grips with long division. A couple of yoga postures, which can bring energy into the body and fresh, oxygenated blood to their brain, and the whole class are in a different learning zone! The reverse will work too – the class has just come in from playtime, they may even have consumed some sugary snacks! The kids are hyper, and their attention is all over the place! 5 minutes of postures to calm and focus and once again the children are in a different zone, as is their teacher! This all sounds too good to be true! Yoga, however, has been proven to help cognitive, emotional and behavioural outcomes. It provides the children and teaching staff with a self-regulation toolbox to help manage or alter their impulses or responses. Peer Mediation has been introduced successfully in schools but combining it with yoga magnifies the outcome! Many Primary and Secondary schools have successfully introduced Peer Mediation into their weekly schedule. At the end of the week, before Golden Time (where the children get to do a fun activity of their choice), the Peer Mediators visit the classrooms. The mediators are volunteers from the upper school who have had training on helping younger pupils resolve conflict. Peer mediation empowers the children and helps develop a sense of community within the school, however, discussions can become a little heated as emotions run high, posing a threat to resolution. I have worked with a number of schools teaching the mediators how to instruct some calming yoga postures, to the whole class, at the start of their mediation session. This not only calms the children down, before the session begins, but helps the mediators stay in a calm place leading to more successful dialogue. Improving literacy skills, even in boys! There are a many reasons why boys are often categorised into the ‘don’t like to read’ group. Simply put, many of them don’t want to be sitting at a desk and learning to read as it’s ‘boring’! Of course it is to a 4year old boy. He wants to be running about and playing with his friends not sitting for hours at a desk. Yoga can help achieve both the learning outcomes and the need for activity. Young children learn holistically – by visual, auditory and kinaesthetic means, often at the same time! Some are more visual or auditory than others but by combining the 3 you are encompassing all and magnifying the learning outcome. Acting the stories out using yoga postures not only helps make the connection in the young brain but also releases feel good hormones as the child has a lot of fun. Little girls are very visual thinkers and love to tell you the colour of their horse, the length of eye-lashes and how bushy the tail is. Little boys are more auditory and kinaesthetic. They want you to listen to the noise the horse makes, have it neighing on its two hind legs and if they can have a sword, welding Zoro riding it then their little hearts and imaginations are bursting with knowledge and joy! On the most basic level the child no longer has the association that reading is boring. Instead, the neural pathways are set up that reading is fun and the path is open for successful learning and a positive association with stories and books. There is no end to the uses of yoga throughout the school day but what is clear is that training the teaching staff to use it has more positive impact than watching a video online. the teaching staff simply being less stressed as they are practicing yoga throughout their day. Either way it’s a win-win situation!